Harka Bahadur Chhetri today announced that he would launch the new political party in Kalimpong on January 31 with corruption by the Gorkha Janmukti Morcha as one of its main agendas. Chhetri, who had quit the Morcha in September, said at a public meeting in Mirik: "We are all ready to float a new political front. Lot of people talk about lack of alternative (to the Morcha) and we are ready to come out as an alternative in hill politics. We will launch our political party in Kalimpong on January 31 and yes, we can (take on the Morcha)." The Kalimpong MLA said, ahead of the launch of the party he would reveal its constitution at a public meeting in Sukna on January 16. Amar Lama, one of the main speakers at the event, said: "One of the biggest problems in the hills is corruption and this will be one of our major agendas and we will make it a big issue in the hills." Elaborating on corruption, Chhetri said: "During my tour in my constituency (Kalimpong), I have found that funds have been sanctioned from three or four departments (of the GTA) for the same road and yet, the work is not completed. We will soon form an RTI cell and get all details to ensure that the guilty are booked." The meeting was organised under the banner of the Kalimpong District Demand Committee, Darjeeling-Dooars United Development Foundation (headed by former Sikkim University vice-chancellor Mahendra P. Lama) and Parcha-Patta Demand Committee. Mirik is about 45km from Darjeeling. 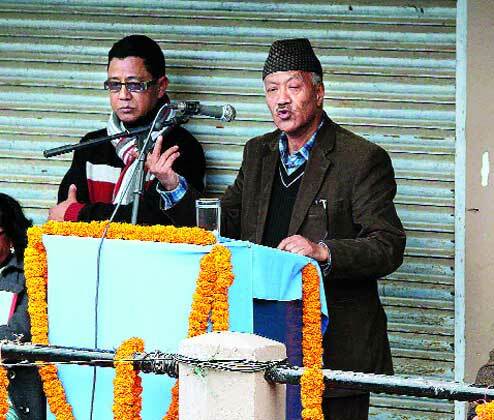 Later, asked about the Gorkhaland issue, Chhetri told journalists: "If anyone will work for Gorkhaland, it will be us. We want to reach there (statehood) through work and not through slogans. Other friends (Morcha) want to reach there through slogans. If we can get 10 years, we will show what we can do." The MLA said Gorkhaland was about bringing and giving all facilities to the people. "Right now, political parties are only making it a slogan to remain in power. We will work to empower our people and reach such a stage that the government will willingly say that you can take statehood as you can administer it now. Right now, it (statehood) is only a sentiment to be in power." Speakers at the meeting sent a clear signal that the new outfit would be of intellectuals with a clear vision. "Our biggest bane is that we have had no good leader with a vision. Our history is also of missed opportunities because of lack of vision of our leaders. Unless our people become aware, there will be no change in the hills. In fact, the situation in the hills is such that instead of a change, we need to do more and that is to transform ourselves," said Mahendra P. Lama. He also rued the people's decision to elect S.S. Ahluwalia as the Darjeeling MP and not a local resident). "Had we been elected, we would have already contributed substantially by implementing the panchayat system, getting the Jelep-la pass opened (for trade between India and China), setting up a central university and so on," said Lama.